Glenn Marcus has superb reviews of many of the inks I use, so rather than "re-invent the wheel", I am going to refer you to his webpage HERE. Be sure to check out his "Inks of Choice" HERE. 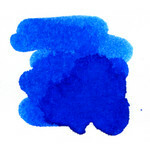 There are many great inks and colors available from the Goulet Pen Company. Goulet has worked very hard to offer you swabs of all the colors available and even has sample vials available so you can try out a color before buying a whole bottle. If you want more info on ink you should definitely check out their website HERE. Pendemonium is a great source of information on inks - check out their ink facts HERE. They also sell a complete selection of inks as all kinds of other pen supplies too! Also, before I begin I would like you to note that Waterman Inks are generally considered to be the "safest" ink for all fountain pens. They also have the best bottles. The bottle is truly innovative in its shape which allows one to lean it on a faceted side to accommodate filling a pen when the bottle is less than half full. I know of no other ink bottle that allows this and other bottles are impossible to work with when they get too low. Therefore, I save all my empty Waterman bottles so I can fill them with other inks. I also routinely use a syringe (syringes are available from Goulet Pens or Pendemonium above) to get the last drops out of any ink bottle. So here we go with my favorite inks! Note: Even though the Ebony Blue below has the word "blue" in it's name. To my eye it is definitely more dark green than blue. Hence, I have listed it as a green ink. OK - I'm not going to show color swabs of these inks because - let's face it - black is black! No way you will tell the difference by looking at black samples on a computer. That being said, in real life on paper there is indeed a difference. One of my all time favorites is Noodlers Bullet Proof Black. It is as black as black can be and as an added bonus it is "bulletproof" meaning that it cannot be erased off the paper by water or even bleach! Indeed - it is un-erasable and therefore considered "eternal". It is therefore my number one choice for writing checks and signing legal documents, addressing envelopes - anytime I need to make sure that my writing will not be compromised. Noodlers also makes a super black ink called "Heart of Darkness" that is also bulletproof and is incredibly black. One thing that is noteworthy is that although it won't come off the paper, it cleans up easier than many other inks. It washes off your hands and cleans out of your pens easily. But once it hits paper - it sticks forever! Click on the bottle at right to go to the Noodlers website. Waterman Black, Mont Blanc Black, Sheaffer Quink Black, and Parker Skrip Black (in that order).